I’ve upgraded the rating by a grade – on thinking about the book I really did enjoy the character development for its own sake. Except for the real creeps, the characters were all sympathetic – good guys but very flawed – and that was done well. I never did manage to blend Sonny the prisoner (“addict -redeemer -martyr”) with Sonny the avenger and Sonny the lover. That was really too complex. The others were fine, nicely done even. The basic premise, that Sonny Luftus took it so much to heart when he learned that his father, a prominent police detective, was found guilty of corruption, he (Sonny) turned to heroin. And he stayed stoned by admitting to crimes he didn’t commit – the heroin provided by the corrupt police department in exchange for a plea of guilty or more information provided by Sonny. This crime info is provided by other jailed criminals who regard him as a sort of father confessor and absolver of crimes. There’s a dead crooked priest involved, too. Enter Simon Kefas, detective extraordinaire – who has a gambling addiction and an incredibly forgiving wife with her own share of very real problems. And then Sonny, out and about in greater Oslo, staying at a home for addicts, falls in love with his own wonderful woman – those parts were actually kind of sweet even if I didn’t fully understand him. I have just gone back to Neabo after a long absence. Have The Bat on reserve at the library, I hope I enjoy the early Harry Hole more than you enjoyed The Son. 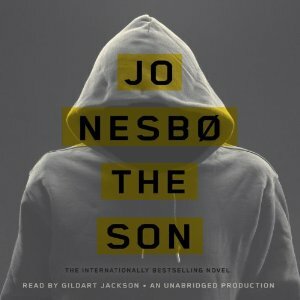 I suppose I might have gone a bit overboard in my comments – maybe I wasn’t in the mood for quite so much violence as Nesbø is prone to. Hope you enjoy it!